A shipbuilding firm in Wirral has secured a £44m contract to build part of one of the biggest and most powerful warships in the UK. 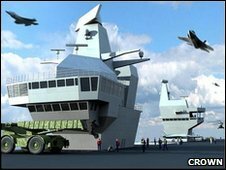 More than 350 jobs will be created at the Cammell Laird Shipyard to help construct the flight deck of aircraft carrier, HMS Queen Elizabeth. Commissioned by the Ministry of Defence (MOD), the Birkenhead firm will start work on it in the next few months. Council leader Steve Foulkes said it was "fantastic news for local people". The MOD has agreed contracts, worth a total of £5bn, with shipyards and manufacturers across the UK to build both HMS Queen Elizabeth and its twin warship the Prince of Wales. The deal with the MOD will be a big boost to Cammell Laird which has had a troubled past. In 2001 it went into receivership and was forced to close. Seven years later it reopened and, under managing director John Syvret, it has won several high profile contracts. It is predicted the firm will be working on the programme until December 2012. Aircraft Carrier Alliance (ACA), which helped broker the deal, said it was "great news for the region and a testament to the skills of the workforce on Merseyside". Mr Foulkes added: "This is new work and we can show the quality we've shown with many of the other contracts, the auxiliary fleet work we've won, we can say to the world 'we're back open for business'." William Laird founded the Birkenhead Iron Works in 1824 and by 1828 it was making ships. Cammel Laird was born in 1903 when Sheffield steel manufacturer Charles Cammell joined forces with the Lairdcompany. The ships built at Birkenhead included battleships Rodney (1927) and the Prince of Wales (1941) as well as aircraft carrier the Ark Royal, in 1938.